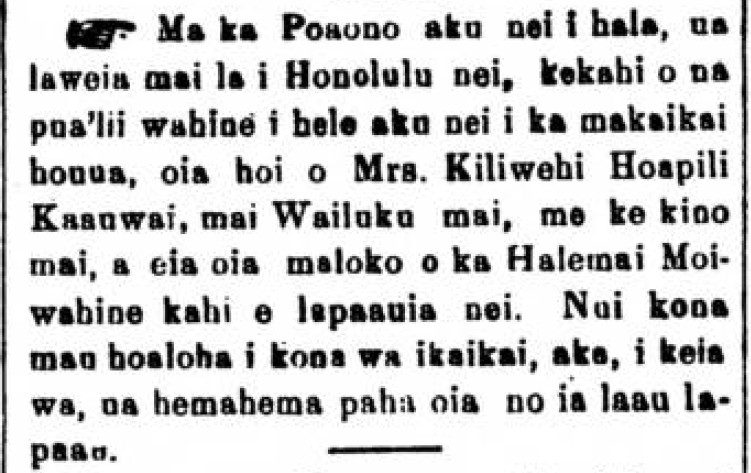 The story printed in the Kuokoa pertaining to the death of Samuel Kekuiapoiwa on the 23rd of June past on the shores of Hanapepe; that he was well known for his good deeds and there was a expression of love for him in our Kilohana* on July 17; he was none other than a descendant of Kamehameha V. This is his whole name—Kapuaiwa Kamehameha V Kekuiapoiwa. 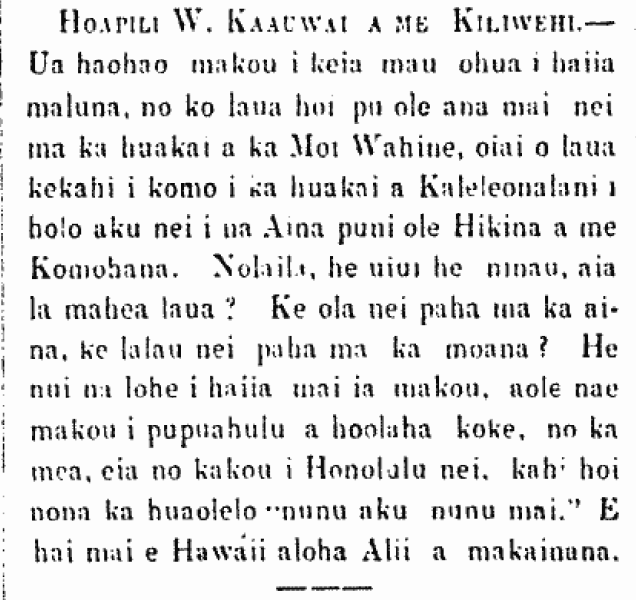 From the suite of Queen Emma, Hoapili Kaauwai and Kiliwehi, 1866. Hoapili W. Kaauwai and Kiliwehi.—We are curious about the attendants mentioned above, because they have not returned from the trip of the Queen, whereas they were two who joined in on the journey of Kaleleonalani when she set off for the continents of the East and the West. Therefore we question and ask, where are those two? Maybe they are staying on land or gone astray at sea? We hear a lot of stories, yet we will not lose our head and spread them at once, because here we are in Honolulu where it is said, “speculate this way, speculate that way”.¹ Tell us, O Alii and makaainana loving Hawaii. ¹”Nunu aku, nunu mai” perhaps is a variant of “Nune aku, nune mai”, and is a saying associated with busy Honolulu. Is there anyone with more information on this saying? Ka Nupepa Kuokoa, Buke V, Helu 43, Aoao 2. Okatoba 27, 1866. Mrs. Kiliwehi Hoapili Kaauwai passes on. 1873. Ka Nupepa Kuokoa, Buke XII, Helu 45, Aoao 2. Novemaba 8, 1873. Last Saturday, brought to Honolulu from Wailuku was one of the royal women who had gone on a tour of the world, that being Mrs. Kiliwehi Hoapili Kaauwai, with an ailing body, and here she is now at the Queen’s Hospital being treated. She had many a friend when she was in good health, but now, she perhaps is lacking in this medicine. Ka Nupepa Kuokoa, Buke XII, Helu 42, Aoao 2. Okatoba 18, 1873.